With the increasing interest in local food and concerns about the hidden costs of transporting food over long distances, a growing need for food security within countries and communities, and more information constantly coming to light about the connection between food and human health, this new book from award-winning author and illustrator Jan Thornhill helps to shed some light on the whole issue of food for young readers. Who Wants Pizza? answers questions like Why do we need to eat? Where does our food come from? Is there enough food for everyone? and Are some food choices better than others? Packed with illustrations and photographs on every page, and bright with colour, this book presents cultural, historical and scientific information in small bites that the target age group will find easily digestible. 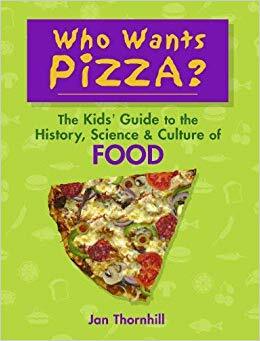 Covering many topics, it could serve as an outline for a teaching unit about food, a jumping-off point for individual or group research, or just as interesting reading for kids who want to know more about what they put in their mouths.